Who said August is a slow month? I have a jam-packed edition of News & Notes this week. We just returned from a week-long family vacation to Cooperstown, Niagara Falls and Toronto, and I'm working on another "Road Trip" posting chronicling our holiday. August is nearly halfway through, and the return to school for the kids is nigh. For parents who have children with celiac disease, feel free to download and modify the handout my wife created a few years ago that's given to our son's teachers. Since my last News & Notes post, I wrote about the return of Dock Street Brewery's Sudan Grass Ale - coming in September - and reviewed West Philly's Rx restaurant. To the restaurant news we go. Reader Matthew F. tells me that Mumbai Bistro, the new Indian restaurant in Philadelphia's Washington Square West neighborhood (930 Locust Street, 215-418-0444), labels its menu items gluten free, lactose free and vegan as appropriate. Thanks to reader Anne R. for sharing word that Paradiso, a South Philly Italian (1627 East Passyunk Avenue, 215-271-2066) was able to accommodate her husband's gluten-free meal. Philadelphia's Pumpkin Cafe (1609 South Street, 215-545-1173) and Pumpkin Restaurant (1713 South Street, 215-545-4448) are gluten-free friendly. The Atlantic City location of Carmine's (2801 Pacific Avenue, 609-572-9300), the famous family-style Italian restaurant in Manhattan, serves gluten-free corn spaghetti. Also down the shore, Green Cuisine in Stone Harbor (302 96th Street, 609-368-1616) offers Food For Life brown rice tortillas for wraps. Props to reader Amanda T. for the find. Collingswood Indian IndeBlue has updated its menus to specifically call out gluten-free and vegetarian choices. Chef Rakesh Ramola has added safe options by using chickpea flour in more recipes. Cape May's Lucky Bones Backwater Grille has added a solid gluten-free menu that lists, among other items, pizza, crab cakes, sandwich rolls, pasta, kids' macaroni and cheese, as well as Redbridge Beer and Woodchuck cider. The next Philadelphia Gluten-Free Supper Club dinner will be at Sazon in Northern Liberties on Tuesday, August 24 at 7:30 p.m. For more information about the club and to be added to this month's reservation, e-mail reader Adriana Z.
Monica Glass, the pastry chef at Center City's 10 Arts restaurant who was featured in this space a few weeks ago, wrote an article for the Philadelphia Inquirer this week elaborating on how she has embraced her celiac disease diagnosis and her career. Great pictures and recipes too! In addition to its sister eateries mentioned earlier in this post, Pumpkin Market in Philadelphia (1610 South Street, 215-545-3924) carries gluten-free products from Amaranth Bakery and Greenwood Kitchen, among others. Healthy Bites To-Go in South Philly (2521 Christian Street, 215-259-8646) has many gluten-free foods to choose from. Thanks to Adriana Z. for the tip. A new beer arrival at South Philly's Hawthornes (738 South 11th Street, 215-627-3012) is Sprecher Brewery's Mbege, with hints of banana. Lincoln Financial Field will against have gluten-free food available at Eagles home games this season. Choices include hot dogs, Froose fruit snacks and juice and trail mix (all available at the Section 117 "Philly Favorites" stand) and Redbridge beer (at the "Liberty Bell Tap Room" at Section 118). Thanks to reader Ashley B. for the deets. 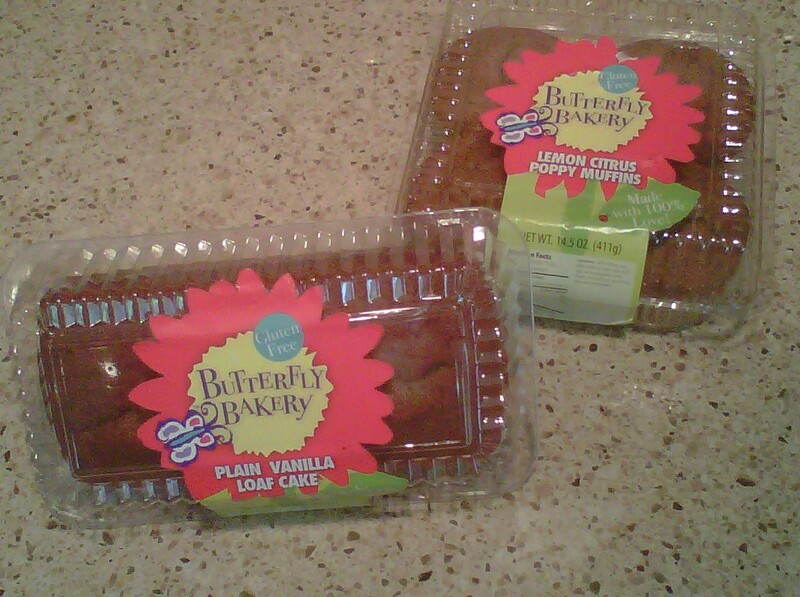 New at Wegmans are gluten-free muffins, cakes and cookies from northern New Jersey's Butterfly Bakery. My better half spotted the Wild Blueberry and Lemon Citrus Poppy Muffins and a Vanilla Loaf Cake (made with teff flour) and Chocolate Chip Cookies (teff and amaranth flours). Hard to believe, but an entire generous-sized lemon muffin is just 110 calories and 2 grams of fat. Each package is priced at $5.99. Have you shied away from the new Tastykake Butterscotch Krimpets Cream Ice at Rita's? Dive in, because it's gluten free. Just hitting supermarket shelves now from Amy's Kitchen: Gluten-free Bean & Cheese Burritos and gluten-free/dairy-free Bean & Rice Burritos, made with organic gluten-free tortillas wrapped around organic pinto beans, rice and vegetables in a mild Mexican sauce. Each burrito, with a suggested retail price of $3.19, has less than 300 calories, less than 8 grams of fat and up to 9 grams of protein. Schar recently introduced several new products, including Cheez-It-style crackers. The company's Cheese Bites and par-baked Baguettes and Sub Sandwich Rolls are available - and on sale right now at 20% off - at The Gluten-Free Mall. Reader Katey B. recently found Goldbaum's ice cream cones and gluten-free cookies and crackers at the Christmas Tree Shop location on Route 70 in Cherry Hill. She tells me that the chain's inventory changes often, so finding these products may be hit-or-miss. Glenny's is offering Gluten Free Philly readers 15% off all Soy Crisps using code GFPHILLY at checkout through this link. All varieties except Multigrain are gluten free. If you've been thinking about purchasing Triumph Dining's restaurant cards (they come in 10 languages), now's as good a time as any. The publisher is offering free shipping on all products - the cards and its grocery and restaurant guides - through August 25 using code MK958. Triumph has just released the latest (5th) edition of its national gluten-free restaurant guide with a money-back guarantee. You can order through this link. Get dollar-off coupons from Udi's Gluten Free Foods by submitting your name, e-mail address and ZIP code at this page on the company's website. The coupon can be printed twice. Nicole M. Seitz is a gluten-intolerant psychotherapist specializing in helping people adjust to the emotional aspect of living with celiac disease. In September, she will be launching a special therapeutic group, meeting every other week in the Chestnut Hill /Mt. Airy section of Philadelphia, for people with celiac disease, gluten-intolerance and food sensitivities. She intends for the group to be a benefit for people who may be wrestling with adjusting to the diagnosis. For more information about starting dates, fees, and to reserve, contact Nicole at 267-971-5729. I follow your blog regularly, even though my celiac 27 yr old daughter lives in NYC. This is what I posted at Main Line Baking Company's website. I wouldn't have known about their business were it not for your updates!! So thanks for a scrumptious (fattening???) "lead"!! We ordered a gluten free carrot cake to celebrate our (celiac) daughter's engagement, and took it to our friend's home at the shore. 12 guests ate it for dessert & we still took 1/2 home with us- that's how big it was. EVERYONE was amazed how delicious it was - reminiscent of the Commissary Carrot Cake from the 70s. Kudos to the bakers!! wishing you LOTS of success- we plan to return for a bride/groom cake next year!!! Just came back from a vacation in North Wildwood. Ate at Lucky Bones restaurant three times. First tried cheeseburgers (my daughter and I both have Celiac). My daughter loved it! The roll was really good. Then tried the pizza which was really good. Next had the shrimp salad sandwich and macaroni and cheese. They both were great. My shrimp salad sandwich had tortilla chips on the plate (they are not gf). I told the waitress about it and they gave me a new sandwich. The manager came to my table and apologized about the mix up. She even took the sandwich off the bill! If ever in Cape May, definitely try this restaurant.